In 1927, Jeanne Lanvin asked André Fraysse to create a perfume for her daughter’s 30th birthday, whom he wanted to offer “the best perfume in the world.” Fraysse was only 27 years old, but with Paul Vacher’s help he created unique perfume. Marguerite, Lanvin’s daughter, already an accomplished musician, called it “Arpège” (“arpeggio”). Along with Chanel’s Chanel No. 5 and Patou’s Joy, Lanvin “Arpège” is one of the three best known perfumes in the world. 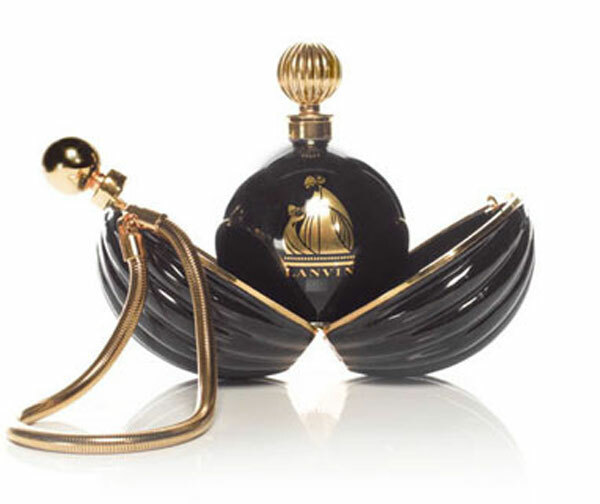 Now, Lanvin celebrates 85th anniversary of this perfume, mythical symbol of femininity and French luxury by launching a polished, black enamel minaudière holding case embellished with a braided snakelike gold handle, which houses the iconic scent. Arpège fragrance for women provides a truly classical French perfume. Top notes: Bergamot, Orange Blossom, Honeysuckle & Rose. Middle notes: Jasmine, Iris Blossom, Ylang-Ylang. Base notes: Sandalwood, Patchouli, Vetiver & Vanilla. Priced at $3,040, this perfume, a symbol of all the women who love beauty and love, elegance and refinement housed in a special minaudière holding case will be available in Lanvin boutiques and website from February 2013.